“Curiouser and curiouser!” Cried Alice (she was so much surprised, that for the moment she quite forgot how to speak good English).” -Lewis Carroll (England 1832-1898). Until the mid-1980’s, I had never really paid any attention to the ancient art of taxidermy. At the time, I had recently started living and working in the Darlinghurst area of inner Sydney. One day, while walking back to my compact bedsit, I noticed an unusual shopfront facing Flinders Street, between the Taxi Club and the Palace Hotel, under an awning with the emblazoned words ‘Animal Fetish’. This fascinating enterprise, run by the McRae brothers, was a taxidermy studio that supplied stuffed animals as theatrical props and interior decoration, and it was crammed full of a menagerie of mounted and preserved beasts, birds, reptiles and marine creatures, as well as a range of other related curios, such as prints, costumes and kitsch souvenirs rendered from various animal skins and skeletons. I could not help but be reminded of the Animal Fetish studio, both while listening to poet Kristin Hannaford reading a selection of her poems from her new collection ‘Curio’ (Walleah Press 2014) at Live Poets at Dan Bank a few weeks ago, and during my subsequent reading of her book for this review. Curio is a thematic collection of poetry derived from comprehensive historical and archival research into the lives and work of a mother-and-daughter pair of taxidermists, Jane Catharine Tost and Ada Jane Rohu respectively, who worked in Sydney through the mid-to-late Victorian era to the early 20th century. Their time dedicated to this profession also coincided with what is now considered the ‘golden age’ of taxidermy, as natural history studies proliferated, in the wake of one of the biggest and most controversial arguments of that age, precipitated by the theory of evolution published in 1859 and 1872 in two books by Charles Darwin (1809-1882). Incidentally, Darwin visited Australia during his five-year voyage around the world on the HMS Beagle in the 1830’s. The Australian continent, and the South Pacific region, became a region of intense investigation by scientists in various disciplines– anthropology, archaeology, botany, biology, entomology, geology, ichthyology, ornithology, paleontology, et al, as well as artists specialising in landscape, ethnographic and wildlife illustration, ever since specimens of fauna, flora and indigenous people and their artefacts had first been exhibited in Europe after exploratory voyages, such as those of Captain James Cook, during the 18th century. This is the historical background and context by which I read this collection, from the explanatory Author’s Note, through the poems themselves, to the extensive bibliography, all contained in this slim volume. The 60 pages of poems are not, however, a chronological record of the times and of the two women portrayed therein. Rather, they are a collection of episodic and reflective pieces that often incorporate quotes from the sources and references that Kristin Hannaford diligently researched while writing this collection. Many of the poems are prefaced with a brief explanatory note. ….Welcome to Tost & Rohu’s carnival of the unusual! ….specimens and requisites at what you do not know, what you do not have: bric-a-brac. 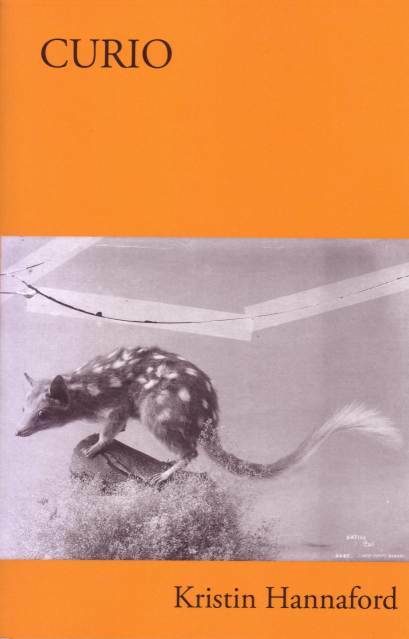 Some of the poems focus on particular taxidermy commissions undertaken by Tost and Rohu, such as the now extinct thylacine (Tasmanian tiger) and the Irrawaddy squirrel from Burma (Myanmar). Such commissions came from collecting institutions such as the Australian Museum in Sydney, while others were for the purpose of displays prepared for large-scale international exhibitions held in Australia and abroad, events that had been inspired by the success of the monumental Great Exhibition held in London’s Crystal Palace in 1851.
attitudes of fountain, or Vedic statue. Other poems relate to the recognition and remuneration of the two women in their careers as taxidermists. Unusually for those times, when careers and wages for women were usually strictly limited, they were paid equally to men in the same profession by the Australian Museum. into her phylums and classes. The title of this collection ‘Curio’ also draws our attention to a parallel theme running throughout – the human trait of curiosity about the strange, the exotic, the unfamiliar, the unusual and, for commercial purposes, the production of collectible curios, ephemera and souvenirs in distinct counterpoint to the scientific demands of the taxonomic representation of animals. The poem ‘Curiosity’ is based on a 1921 shop catalogue. glass knife stone knife millstone dilly bag. A more gruesome aspect of colonial era taxidermy related to the preservation of the bodies of indigenous people, as elicited in the poem ‘Sarcophagus E1 81 84’, about the curation of the skeleton of a Melanesia chieftain from New Caledonia in 1909.
subject to our imminent inspection. The taxidermy and curio dealing shop of Tost and Rohu continued until 1923, when it was acquired by Sydney bookseller James Tyrrell (1875-1961), who was very well-known to that city’s bibliophiles and collectors, as well as to artists, poets and writers over many years. Poets including Henry Lawson, Roderic Quinn and Kenneth Slessor dedicated poems to Tyrrell and/or his bookshop. Tyrrell’s Bookshop continued in various incarnations for several more decades, and I used to frequent it as a younger man between the mid-1970’s and early 1990’s, in its final address at Crow’s Nest in northern Sydney. So this factual aspect of Kristin Hannaford’s collection Curio also provoked memories of my own bouts of browsing and searching for literary curiosities, which has been a lifelong pursuit. Kristin Hannaford’s Curio is a very well conceived collection which attains a fine balance between the poetic and the prosaic. This book successfully animates an arcane historical topic that draws upon the aesthetics and the practical skills of taxidermy, and the scientific perspective of a bygone era in colonial and newly federated Australia, together with the general popular perceptions of that era. Hamish Danks Brown (born 1957) grew up in a soldier settlement farmhouse in Forestville NSW in an artistic family. He has worked in the arts,media and communities in Sydney, Canberra, Wollongong, Brisbane and the Sunshine Coast of QLD, where he was also a full-time carer for his parents until this year. He has been writing since schooldays,but it is only in the past decade that he has become a regular writer, blogger and spoken word performer a.k.a. Danksta Downunder. His interests include the arts, archaeology, astronomy, neuroscience and being a satirical opponent to the status quo. He has published one chapbook ‘All Other Destinations’, is working on his second,and publishes frequently online, and regularly in various poetry anthologies and journals in Australia and overseas. This entry was posted in Curio, Hamish Danks Brown, Issue 13, Kristin Hannaford, Walleah Press and tagged Australian Literature, Australian poetry, poetry by Mark Roberts. Bookmark the permalink.